The High Court of Justice on Tuesday accepted petitions against the Tal Law which exempts yeshiva students of military service, and will not be extended in August as a result. 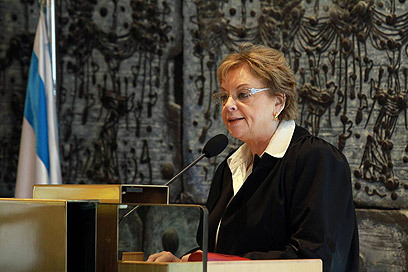 Outgoing Supreme Court President Dorit Beinisch was among those who supported the ruling while incoming president Asher Grunis was among those who opposed it. Beinisch ruled that the law is unconstitutional and should therefore be rescinded. "The law, which has already been found in violation of the right to equality as part of the right to dignity, does not meet the proportionality standard and is therefore unconstitutional," she wrote. Those in the majority opinion included justices Miriam Naor, Elyakim Rubinstein, Esther Hayut, Hanan Meltzer and Neal Hendel. The dissenters included Grunis, Eliezer Rivlin and Edna Arbel. The panel concluded that the State failed to implement the law. This failure, Beinisch stated, was the result of legislated arrangements including the option to postpone military or national service until the stage where applicants are family men. "The implementation of the law during the extended test period it was given indicates that the law has inherent impediments which greatly affect its implementation," Beinisch noted. "Can one say that with the passage of nine years the enlistment of 898 haredim and the joining of another 1,122 for a short, undefined national service out of a group of 61,877 constitute fulfillment of the law's objectives? "The enlistment of only 530 haredim to designated courses, nine years after the law's legislation indicates an implementation failure," she said. "The fact that there is a rise in the number of recruits is indeed positive but is not enough. Nine years after legislation one would have expected a more substantial number of recruits. The low rate of enlistees, coupled with the relative ease with which enlistment procedures are changed, illustrate a fundamental difficulty in the law itself." As a member of the dissenting bloc Grunis expressed concern that another petition will be filed. "The court's constant dealing with haredi enlistment without any real progress being achieved through judicial involvement does not contribute to the court's standing. It would be an illusion to expect that judicial rulings bring about the enlistment of haredim to the IDF and their joining the work force." Addressing the rescission, Prime Minister Benjamin Netanyahu said that a new bill aiming to bring about better "sharing of the burden by all segments of Israeli society" will be drafted in the coming months. The petitions were filed by the members of the Movement for Quality Government and the Meretz party. The ruling may well cause a stir in the political system. Yisrael Beiteinu and Kadima are planning to push bills that will apply the enlistment duty to all Israelis in the coming weeks. A senior Knesset figure told Ynet that the Tal Law may be the cause for the current government's downfall. "It's one of the most controversial laws on the Knesset's agenda." Yisrael Beiteinu's bill will include a limited quota of religious-based army exemptions and will require military or national service for all. Kadima is slated to propose the "Civil Service bill" stating that all those eligible will be drafted and the rest will be obligated to volunteer at public facilities such as hospitals and community center for a period of two years. Shas Chairman Eli Yishai said that an inter-ministerial effort will be launched to draft a new bill to take the Tal Law's place. "Together with the Defense and Justice ministries, we will come up with a new law to regulate the status of the yeshiva students, whose contribution to the Jewish people and the State of Israel is obvious to any Jewish believer." Ultra-Orthodox sources voiced their dissatisfaction with the ruling but called for a bi-partisan effort to reach a new arrangement on the issue. "We're angry at Netanyahu… but now we have to think together how to buy more time until after August and solve the problem," on source said. Yishai has met with the prime minister on Tuesday night over the ruling, and the two agreed to confer on the matter soon. 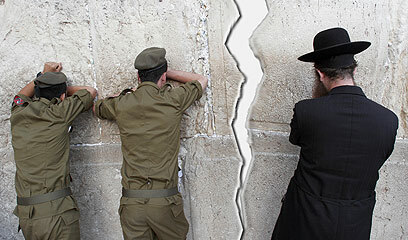 The Tal Law passed a Knesset vote in July 2002 and cemented the army service exemption for yeshiva students. According to the law, a yeshiva student can decide at the age of 22 whether to continue to study or enlist in the IDF for a reduced service. It was extended five years later by another five years. Five motions against it were filed with the High Court of Justice claiming it violates the principle of equality. See all talkbacks "High Court rules against extending Tal Law"